The crown of your tooth is the portion of your tooth above the gumline. A dental crown is a tooth crown restoration that can go directly over your natural tooth. Dental crowns are used to restore damaged teeth and to protect teeth from further decay or infection. A dental crown can also be used to enhance or improve a tooth’s shape. Dental crowns are a fantastic dental innovation because they allow us to save teeth that would normally require extraction. Our dental crowns are made with the finest quality porcelain materials that perfectly replicate the color and translucence of your natural teeth. With your Hamilton dental team, your restorative dentist always has your whole health in mind. Hamilton Family Dentistry is a 100% mercury-free dental office. We use only tooth-colored materials that are completely safe and that will enhance or restore the appearance of your smile. Our dental crowns are used in many of our procedures and can be used to create dental bridges. A dental bridge is a dental appliance that uses porcelain crowns to fill in the gap left by a missing tooth. Dental bridges restore the appearance and functionality of your smile and will allow you to enjoy speaking, eating, and smiling with a full set of teeth again. A dental bridge is created by attaching crowns to teeth adjacent to the gap. 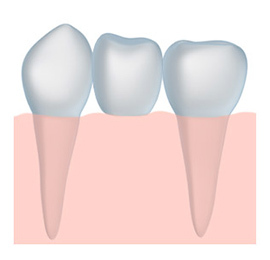 These crowns serve as posts for the bridge and more crowns can be cemented in between them to fill in the space left by one or more missing teeth. To find out more about dental bridges and dental crowns, call us at our office today.